Note: Every blades has indicated alphabet A and B. Please install in correspondence with blade A and B. Otherwise the drone will fail to take off. This STEM toy is build to develop kids Science, Technology, Engineering and Math skills. Play and learn, make playtime more meaningful! Build Social Skills: Great toys for playing with friends and classmates. Watch as they build, use tools and create stories with these educational toys. Perfect engineer tool toy to keep kids busy! Encourages children to work together as a team, thus greatly aiding in enhancing their social skills as well! Drone Size: 8 x 8 x 5 cm / 3.15 x 3.15 x 1.97 inches. Built-in Drone Battery: 3.7V 350mAh Li-Po battery. Charging Time: Approx. 50 minutes. Battery for controller: 3 "AAA" batteries required (not included). 360° ROLL-OVER: The simple flying of WSAD is to boring, and the new 3D rolling makes it possible for excellent performance of flips and rolls by simple push of the button. Altitude Hold Mode: Drone will altitude specified a flight mode. Beginners easy to manipulate. More Stable in flight. Headless Mode: Fly the quadcopter just ignore the direction. Once the fuselage direction can not be recognized, it can enter headless mode so as to continue the flight. 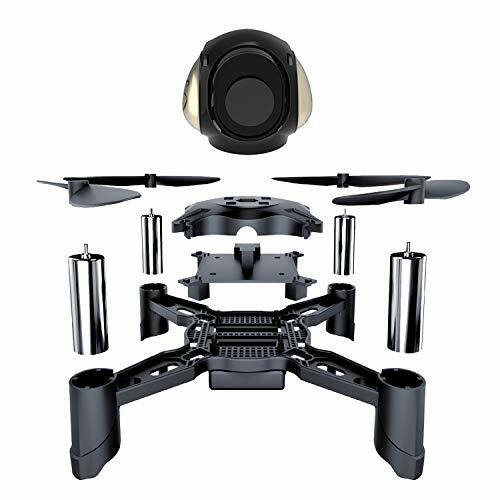 FLEXIBLE CONTROL MOVEMENT: Maxxrace Racing DIY Drone Have a 360° all angle flexible movement function, ranging from Upward/Downward movement, Forward/Backward movement, Left/Right Rotation, Left/Right Drifting, Up, Down and Stunt Flips. This amazing feature gives you unlimited 360 mobile fun. PERFECT GIFT for BOYS and GIRLS: Fun, Play Left/ Right/ Up/ Down, 3D Roll and Flips, Altitude Hold, Headless Mode, One Key to take off, One key to landing, Controlled by Remote Control. Comes with a detailed manual that provides Accurate Instructions about its Function and Usage. If you have any questions about this product by Maxxrace, contact us by completing and submitting the form below. If you are looking for a specif part number, please include it with your message.